Flowmageddon is a term coined by Morningstar Inc in 2016 to describe the massive outflow from actively managed funds to passively managed ones. This was due to the fact that funds backed by a team of fund managers and researchers were lagging behind those that simply tracked an index. Various reports have been published in recent years showing that most of the actively managed funds in the US have underperformed their passive counterparts. The most notable of these is the SPIVA scorecard. SPIVA is a division of market intelligence firm S&P Global. As at Dec 29 last year, the scorecard showed that 84.23% of the US large-cap funds had underperformed the S&P 500 over the past five years. When you take into account the one-year and three-year performances, the percentage of US large caps that underperformed the S&P 500 were 63.08% and 80.56% respectively. As most passive funds in the US closely track the performance of their underlying indices, this seems to suggest that the longer the period under review, the lower the number of active funds that outperform passive ones. However, the landscape looks rather different in Malaysia, where exchange-traded funds (ETFs) have yet to really take off. The data provided by Morningstar and Bloomberg show that this trend has not fully caught on yet. 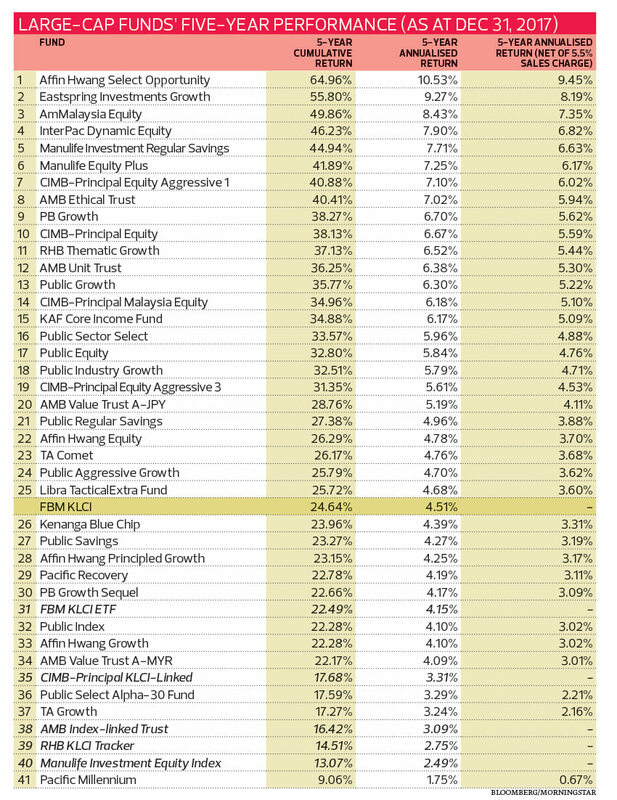 This is shown in an analysis done by Personal Wealth — focusing on actively managed funds that predominantly invest in Malaysian large-cap companies and their passive counterparts that track the FBM KLCI — that actively managed funds generally outperformed the index-tracking ones over 3, 5 and 10 years. In the shorter term, however, the passive funds delivered better results. For the three years ended Dec 31 last year, the top 40 funds (out of 48 active and passive funds) were, in fact, actively managed. The returns of these funds ranged from 3.03% to 15.97% on an annualised basis while the passively managed funds (which ranked from No 41 to No 47) only saw returns of 1.76% to 2.98% on an annualised basis. Similar results are seen over the five-year period. 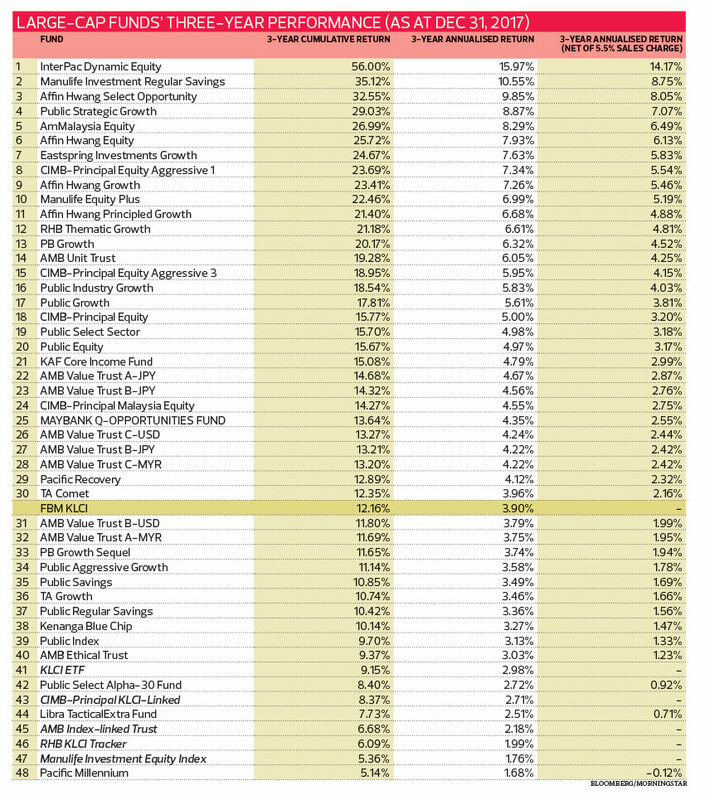 Of the 41 funds, the top 30 were actively managed. These funds delivered returns of 4.17% to 10.53%. Some passively managed funds, however, performed marginally better over the five-year period, with returns ranging from 2.49% to 4.15%. For the 10 years ended Dec 31 last year, all the local passively managed funds showed a marked improvement in performance, with returns of 3.78% to 4.64%. The returns of their actively managed peers ranged from 1.7% to 9.7%. Since the beginning of this year, the cumulative returns of most of the actively and passively managed funds have been negative, especially with the various challenges in the investment landscape. These include volatility stemming from the shocking 14th general election results and the impact of the ongoing trade war between the US and China. Of the 54 active and passive funds reviewed, only four active funds had positive returns for the year to Oct 31. Areca Dynamic Growth was the stellar performer, delivering a cumulative return of 31.63%. The No 2 fund — AmMalaysia Equity — saw a cumulative return of 7.8%. However, in this context, several passively managed funds performed better than many of their active peers. Some local fund managers and financial planners who spoke to Personal Wealth attributed the outperformance of the actively managed large-cap funds in Malaysia over the long term to a lack of market efficiency. Developed markets such as the US are much more efficient. In emerging markets, market players can use technology to identify undervalued stocks and jump on these opportunities very quickly. But they tend to trade manually and the stock prices are more inefficient. “This gives fund managers more space to research the different counters and stock-pick more effectively,” says Areca Capital Bhd CEO Danny Wong. Similiarly, passively managed funds could outperform actively managed ones when the key sectors beat the rest of the market substantially, he adds. De Alwis explains why passively managed funds in the US have outperformed their active peers over the past 10 years. He says that besides higher market efficiency, the US indices have been driven up by large-cap technology stocks such as Facebook Inc, Amazon.com Inc, Apple Inc, Netflix Inc and Alphabet Inc, the parent of Google (also known as the FAANG stocks). “The FAANG stocks have had some of the strongest growth prospects in the market and have pulled the index along since the global financial crisis. Whether this can continue is still a matter of debate and there is a possibility that the index outperformance could reverse in a market downturn or when the tech sector disappoints the market,” says De Alwis. Will local actively managed funds find it harder to outperform the FBM KLCI going forward when the stock market becomes more efficient? “It will be harder for fund managers to identify investment opportunities,” says Wong. De Alwis concurs. He says enhanced market efficiency could make stock-picking more challenging. 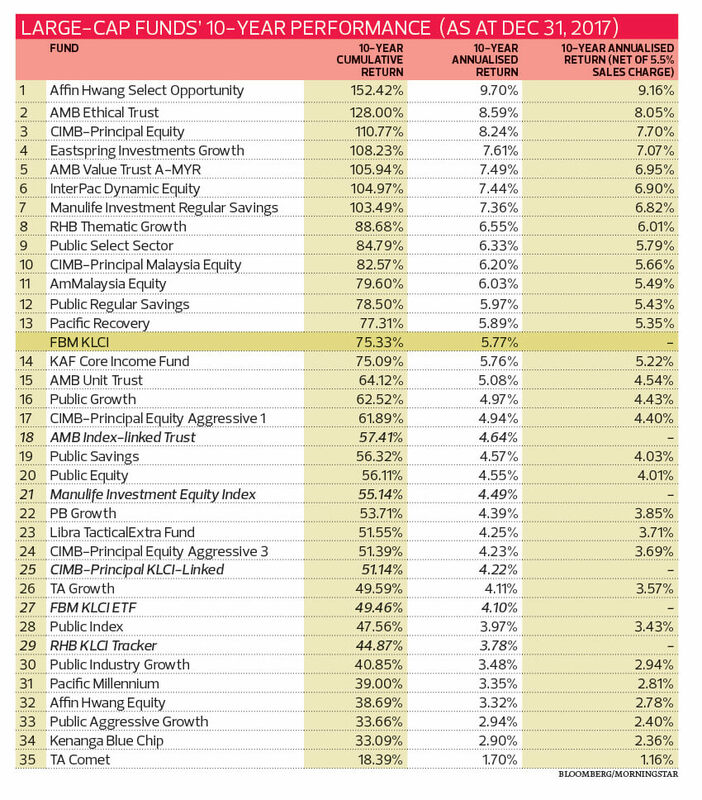 However, it is unlikely that most of the local actively managed funds will underperform the FBM KLCI. “That could happen if a few companies on the index have high growth prospects and become market darlings [like what happened in the US],” he adds. Market observers say this is partly why the local ETF industry has not grown at the pace of similar offerings overseas, especially in the US. According to EY’s Global ETF Research 2017 report, the size of the ETF industry hit US$3.5 trillion in 2016, from US$700 billion in 2008 — a fivefold increase in nine years. The development of ETFs in Malaysia has not kept pace. There are only 10 listed locally, with the first launched in 2007. As at Sept 30, the total assets under management (AUM) was about RM1.96 billion, according to Bloomberg and the ETFs’ fund fact sheets. Excluding the ABF Malaysia Bond Index Fund, which is the only locally listed bond ETF, the other nine ETFs have a total of RM496.17 million under management. In reality, investors will not be able to fully track the performance of a certain index. However, there are a few investment instruments that will allow them to track the performance of the FBM KLCI as closely as possible, one of which is to invest in the FBM KLCI ETF listed on Bursa Malaysia. The ETF, launched by AmInvest in July 2007, tracks the performance of the FBM KLCI. As at Nov 14, it would have cost investors RM176.50 (RM1.765 times 100) to buy one lot of the ETF. The ETF has an annual management fee of 0.5% while the minimum brokerage fee ranges from RM7 to RM30. The fund aims to distribute a dividend income twice a year. As at Dec 31, 2017, the FBM KLCI ETF had generated an annualised return (including dividend) of 2.98%, 4.15% and 4.1% over the past 3, 5 and 10 years respectively. There is a gap between the price movements of the FBM KLCI and the FBM KLCI ETF, which is known as a tracking error. The error exists in most of the ETFs globally for reasons such as incurring operating and transaction costs that would drag down the ETFs’ performance. As at June 5, the FBM KLCI ETF had a tracking error of 0.3%, based on the ETF Watch report produced by Affin Hwang Capital published on June 6. Investors who are interested in trading the FBM KLCI ETF should note that the spread between the buy and sell prices was 1.98% as at Nov 14. The FBM KLCI ETF price chart, shown on Bursa, indicates that the liquidity of the instrument is relatively low with no trading volume on certain days. This means investors may not be able to buy or sell their units at the desired time and price. The second way of tracking the performance of an index is to buy into index-linked unit trust funds. There are currently four of these funds in the market, according to Morningstar’s fund table. These funds are AMB Index-linked Trust, CIMB-Principal KLCI-linked, Manulife Investment Equity Index and RHB KLCI Tracker. These funds have an annual management fee of 0.95% to 1.5%. There is also a sales charge of up to 6.5%. Investors should note the gap between the performance of the index-linked funds and the FBM KLCI. Even the performance of each index-linked fund differs. In an email reply, RHB Asset Management Sdn Bhd regional director and managing director Eliza Ong says the gap between the FBM KLCI and the index-linked funds is due to several factors, including management fees, portfolio rebalancing costs and unutilised cash. “The management fees will reduce the net asset value (NAV) of the fund slightly compared with the FBM KLCI as the latter has no management fee because it is an index, not a fund,” she adds. She explains the reason for the different performance of each fund. “First, the fees charged by the fund houses vary. For instance, a fund house may charge an annual management fee of 1.5% while another charges 1%. The front-load [sales charge] and back-load fees [exit fee] are also different,” she says. There are 10 exchange-traded funds (ETFs) listed on Bursa Malaysia. Six of them give investors access to foreign equities, allowing them to diversify their portfolios or have more investment opportunities. These are the CIMB FTSE Asean 40 Malaysia, CIMB FTSE China 50, MyETF Dow Jones US Titans 50, MyETF Dow Jones Industrial Average 25, MyETF MSCI South East Asia Islamic Dividend and MyETF Thomson Reuters Asia Pacific ex-Japan Islamic Agribusiness. Among the six ETFs that track foreign markets, only three have 3-year and 5-year track records. Of the three funds that have been around for more than five years, the top performer is the CIMB FTSE China 50, which tracks the FTSE China 50 Index. As at Dec 31 last year, it had generated an annualised return of 11.75% and 11.47% (including capital gains and dividends) over the past three and five years respectively. This is provided that investors reinvest their returns consistently over the corresponding years. This is followed by the CIMB FTSE Asean 40 and MyETF Dow Jones Islamic Market Malaysia Titans 25. The former generated returns of 7.13% and 6.82% over the past three and five years respectively while the latter saw returns of 2.23% and 2.77%. In addition to the ETFs that track foreign equity markets, three ETFs track other asset classes — namely, MyETF MSCI Malaysia Islamic Dividend, TradePlus Shariah Gold Tracker and the ABF Malaysia Bond Index Fund. The MyETF MSCI Malaysia Islamic Dividend tracks the MSCI Malaysia IMI Islamic High Dividend Yield 10/40 Index, the TradePlus Shariah Gold Tracker tracks the LBMA Gold Price AM Index and the ABF Malaysian Bond Index Fund tracks the Markit iBoxx ABF Malaysia Bond index, which includes government, sovereign and sub-sovereign debt securities. Are the sales fees high? The returns of FBM KLCI-linked funds will be lower if one takes into account the sales charge imposed on investors. For instance, Manulife Investment Equity Index, CIMB-Principal KLCI-Linked and AMB Index-Linked Trust impose a maximum sales charge of 6.5%, 5.5% and 4% respectively. A 5.5% sales charge, for example, translates into an annualised rate of 1.8%, 1.08% and 0.54% over 3, 5 and 10 years respectively, which drags down the performance of the funds. The RHB KLCI Tracker Fund is the only index-linked fund that does not impose a sales charge, according to its fund fact sheet. Julian Ng, a financial consultant and a former fund manager, says index-linked funds — which are passively managed — should not be charging investors such a high sales fee. He points out that in developed countries, such as the US, index-linked funds carry much lower sales fees. A quick check online shows that Vanguard’s index funds have a sales charge of less than 0.02%. “Fidelity introduced new products in August and there was no sales charge,” says Ng. The proponent of passive investing says US asset management firms can impose such low fees because they have economies of scale and other ways to generate revenue. Local firms may not have such a large market and as many ways to generate revenue that would enable them to push down their fees. “But no doubt, fees of 4% to 6.5% are too high,” says Ng.